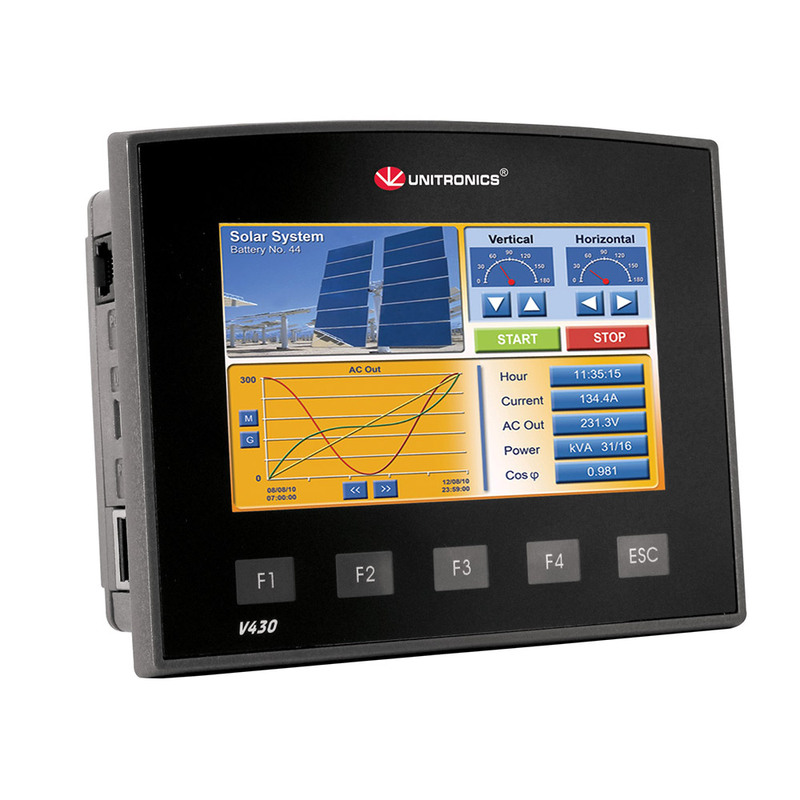 A Unitronics touch screen PLC is the ideal choice when an advanced HMI is required together with powerful PLC capability. 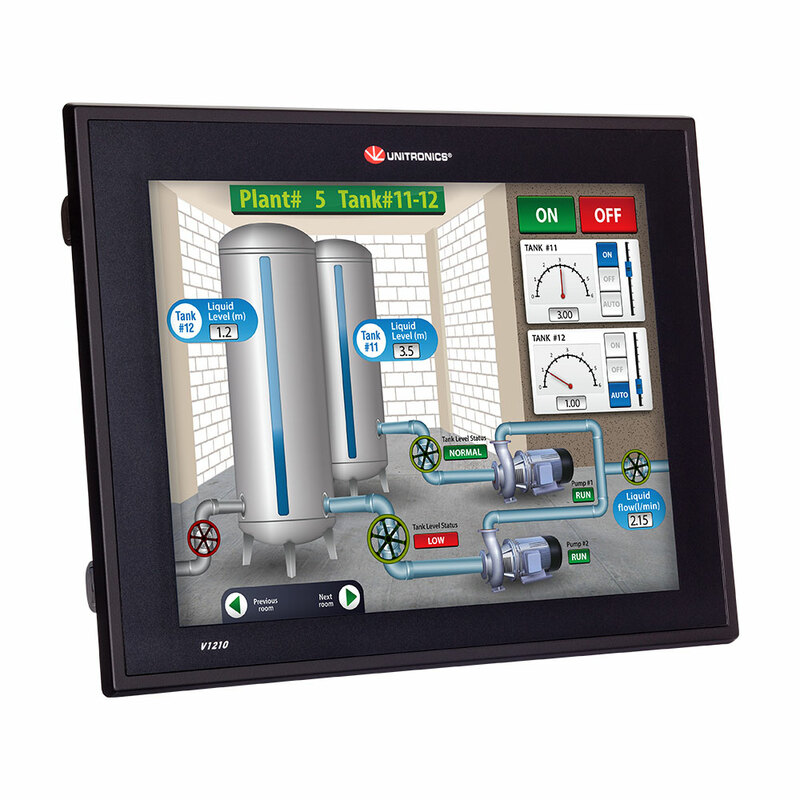 From the 3.5″ Vison right up to a 12 inch touch screen on the Vision 1210, these PLCs have a wide choice of snap-in I/O modules and an integrated HMI to keep down integration costs and development times. The palm sized Vision 350 PLC offers exceptional PID control capabilities (24 auto tuning loops) and diverse I/O options. It has a 3.5″ TFT 256 colour touch screen and can show over 1000 user designed screens with 3.5MB for images and fonts. It can have extensive built in I/O and accepts temperature inputs directly without the need for expensive transmitters. I/O can also be expanded with remote din rail mounted units. The V430 offers a larger wide aspect 4.3″ touch screen with 24 PID loops and 5 programmable operator keys. In addition to the larger screen the unit has increased resolution over the V350, additional I/O variants and a USB programming port. 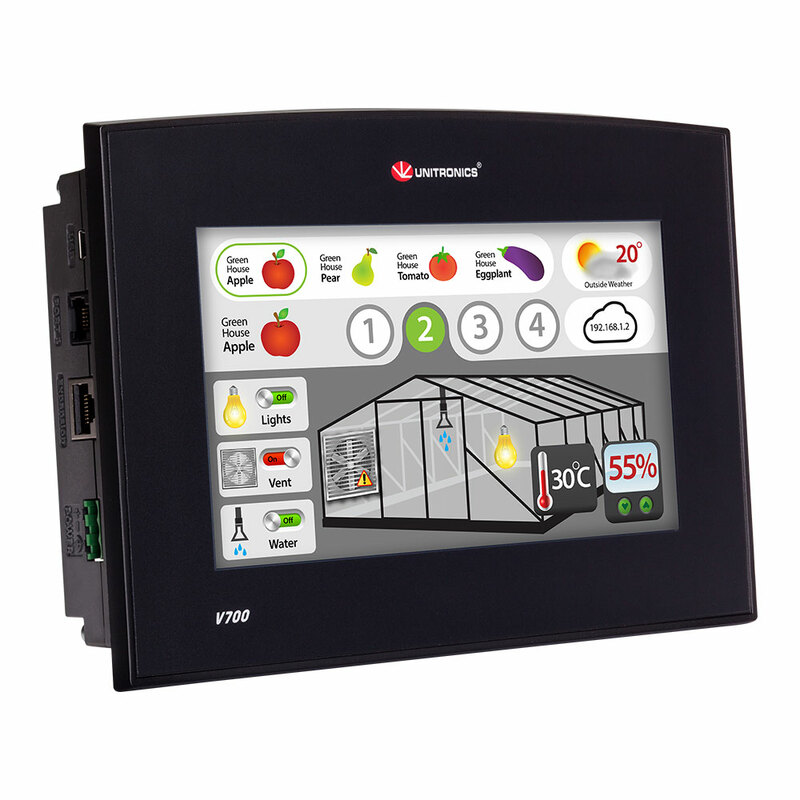 This versatile touch screen PLC includes rear mounted snap-in I/O modules and a mini USB programming port with the option to add 2 further ports. The Vision 700 offers a sleek, high res, 7 inch, wide aspect ratio touch display with built in PLC and 24 independent PID loops. On board I/Os can be added by snapping a module on the rear of the screen, with the option of additional remote expansion. Includes 1 isolated RS232/485 port, a mini USB programming port and built in Ethernet port. 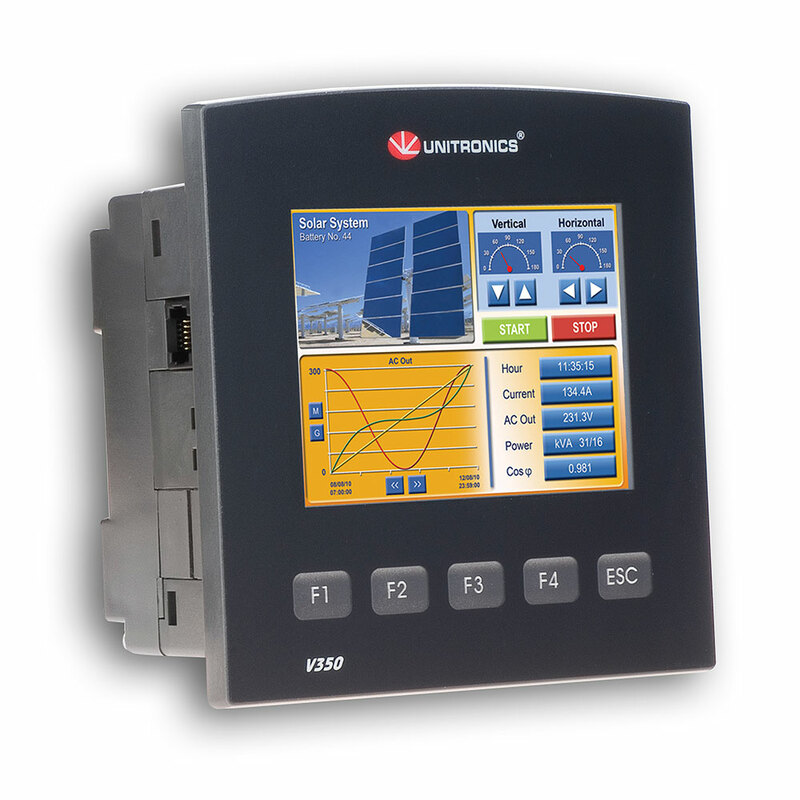 The Vision 1210 offers full PLC functionality with a larger 12.1″ industrial touch screen. A wide variety of on board I/O options can be added to the Vision 1210 by simply snapping a module onto the back of the PLC. This unit features 24 independent auto-tuning PID loops and 4 built in comms ports, supporting an extensive variety of communication protocols. PLC with 3.5 inch colour touchscreen and keypad. 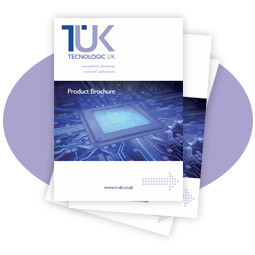 Features 24 PID loops, up to 20 on board I/Os expandable up to 512 I/Os. Built in RS232/485 port. PLC with 4.3 inch widescreen colour HMI and keypad. Features 24 PID loops, up to 24 snap-in I/Os expandable up to 512 I/Os and a built in mini-USB port. PLC with 7 inch widescreen display. Features 24 PID loops, up to 62 snap-in I/Os expandable up to 1000 I/Os. 3 built-in ports: Ethernet, mini-USB and RS232/485. PLC with 12.1 inch colour touchscreen. Features 24 PID loops, up to 62 snap-in I/Os expandable up to 1000 I/Os. 2 built-in RS232/485 ports and 1 CANbus.